These are open to all bridge clubs, whether affiliated to the EBU or unaffiliated. Affiliated clubs should register to take part through My EBU on the EBU website. Unaffiliated clubs should contact richard@ebedcio.org.uk - there is no surcharge for unaffiliated clubs. 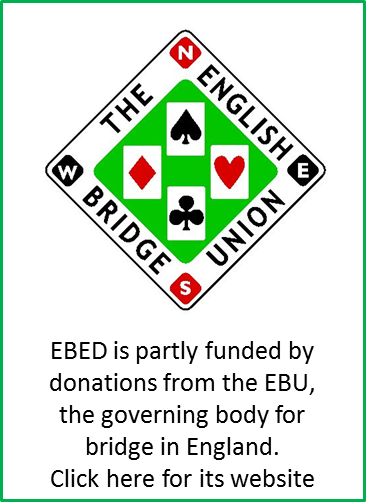 All profits from the events go to EBED, and help to fund its activities promoting and developing bridge in England for the benefit of all players. Thank you to everyone who took part in the EBED Simultaneous Pairs in May and September, and to the clubs which hosted heats. The proceeds from both the Spring and Autumn events will go to help our work in creating the new bridge players, and bridge teachers, which are necessary for the game to thrive. Thank you to everyone who has taken part. The 2018 EBED Student and Schools Sim Pairs took place in the spring, with 700 bridge students and school children playing in their first simultaneous bridge or minibridge competition. We hope it will be the first of many. The event is a great way for bridge students to put what they have learned in to practice in a national competition. The hands can be played any time over an approx 4-6 week period, and a commentary booklet is available to help participants know what they could, and perhaps should, have done.